You did it. You scored tickets to this year’s Splendour in the Grass, held at North Byron Parklands 24 – 26 July. This Byron Bay festival has become wildly popular since its inception in 2001, and tickets typically sell out on the first day—sometimes within 10 minutes! So if you managed to buy tickets, congratulate yourself and now start thinking about the weekend itself. If you didn’t purchase the camping and parking option, then you’re in need of place to stay. 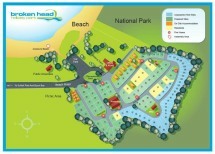 If you’d like to stay somewhere outside of the busy festival crowds or main centre of town, head over to the Broken Head Holiday Park where you can camp out or rent a beach shack for the long weekend. Also, you should take advantage of the bus service that runs between the festival and several areas in the Byron Bay area including, downtown Byron Bay and Suffolk Park (close to Broken Head). There is a reason that Splendour in the Grass surged in popularity over the last 14 years, and that’s because this Byron Bay festival attracts big-name international musicians such as Kanye West, Coldplay, Lily Allen, Outkast, 360 and Empire of the Sun. This year’s headliners include Florence and the Machine, Mark Ronson, Blur and Tale Impala. But there are many other exciting groups playing over the three-day festival such as Death Cab for Cutie, The Wombats, Of Monsters and Men, Rosie Lowe and The Dandy Warhols. But that’s just the tip of the iceberg—check out the full list to see who is playing when so you can plan your weekend. Tipi Forest: Dance the day and night away while in this popular attraction at the festival. A variety of DJs and music producers will spin the tunes over the three days. Global Village: Head over here to experience aspects of the Byron Bay culture such as yoga classes, live art classes, meditation with the Tibetan Monks, massages, and even late night jam sessions. Splendour Forum presented by The Guardian: Taking place each day from 10am to 4pm, this festival sideshow features panels, debates, interviews and Q&A sessions with people like politicians, musicians and activists. Splendour Comedy Club: Make your sides hurt from laughter when you hang out any of the nights of the festival at the comedy club, which will feature 30 comedians over four days this year (starting on Thursday night). Smirnoff Cocktail Bar: Pretty much what you’d guess—drinks in a place where you can relax with your friends. Red Bull Music Academy: Listen to even more music when you visit this area with an array of musicians scheduled to play. Splendour Arts: View new artwork by Australian contemporary artists that include live art, performance, dance, installation and sculpture. Splendour in the Craft: Get your craft on when you visit this area and bring home some awesome, handmade stuff. Little Splendour: A festival for the kids complete with a fully fenced and secure area and tons of activities each day from about midday to 6pm. Babysitting and baby change/breastfeeding tipi are available until midnight. Make sure to abide by the festival regulations while you attend the excellent music shows, and you will have a great time. Things like outside alcohol, metal or plastic water bottles, chairs, video and audio recording devices (like a GoPro) except for mobile phones and no animals are not allowed. For a full list of banned items, check here and for festival rules, check here. If you coming for the Splendour in the Grass festival, then you’re in luck. You’ll hit the Byron Bay area during the low season, which means you’ll enjoy the lowest rates for all of our accommodation options from un-powered campsites to beach houses. So go ahead and book your stay with us at Broken Head Holiday Park and rest easy knowing you got a great rate for your holiday stay—in fact, why not extend your stay past the festival and enjoy all Byron Bay has to offer after the festival crowds leave? You’ll be glad you did!